Highlands Stud part of Ridgemont’s well performed young stallion Potala Palace looks to have a very smart performer on his hands in the form of Dalai’s Promise. The latter, who is a member of her sire’s first crop, maintained her unbeaten record as a three-year-old when running out a brave winner of the Sophomore 1000 (Non-Black Type) at Turffontein on Saturday. Ridden to victory by Ryan Munger, the Ashley Fortune trained Dalai’s Promise dug down deep to hold off a challenge from runner up Tudor Manor and score a neck win. She had previously been thought good enough to take her chance in the Listed Perfect Promise Sprint as a two-year-old. Purchased by current owner Jumat Cola for R90 000 off the Central Route Trading Horses-In-Training Sale at Kenilworth in March 2018, Dalai’s Promise’s long term goal is the R5 000 000 CTS 1200 on Sun Met day. 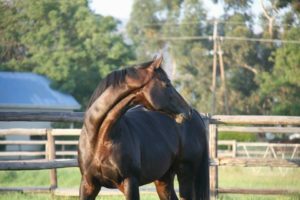 Out of the Tara’s Halls mare Competitor, Dalai’s Promise has now won two of four starts and is unbeaten since relocating to Gauteng. She was one of two weekend winners for Potala Palace, with the latter also responsible for Sunday’s impressive maiden winner Copenhagen. The latter, bred by Highlands Stud, was making just his third racetrack appearance but stormed home to shed his maiden by a length when scoring over 1400m on the turf. Copenhagen is out of Sealed By Love -a mare by Spectrum (also damsire of Potala Palace debut winner Basilius) -who is also the sire of Potala Palace’s 2000 Guineas/King George winning close relative Golan and the latter’s G1 Epsom Derby runner up own brother Tartan Bearer. Former G1 Premier’s Champion Stakes winning sire Potala Palace has made a pleasing start with his first crop to date with his early winners including the debut scorers Basilius and Palace Chapel as well as the above mentioned Dalai’s Promise. The handsome bay is a son of the outstanding racehorse and top class Singspiel, whose son Take Cover won the 2018 Listed William Hill Beverley Bullet Sprint Stakes –at the age of 11! Singspiel, a half-brother to outstanding sire Rahy and Rakeen –sire of Jet Master, was a consistently successful sire whose progeny won such top race as the Dubai World Cup, French Oaks, Gold Cup, Breeders’ Cup F&M Turf, Gran Criterium, Sussex Stakes, Dubai Sheema Classic and Queen Elizabeth II Stakes.